J. Palisa discovered asteroid #137 Meliboea. Prosper Henry discovered asteroid #162 Laurentia. L. Carnera discovered asteroid #470 Kilia. C. Jackson discovered asteroid #1264 Letaba. C. Jackson discovered asteroid #1505 Koranna. USAF Major Robert M. White flew X-15 flight # 36 to an altitude of 32.004 km (105,000 feet, 19.9 miles) with a top speed of 4947 km/hr (3074 mph, Mach 4.62). 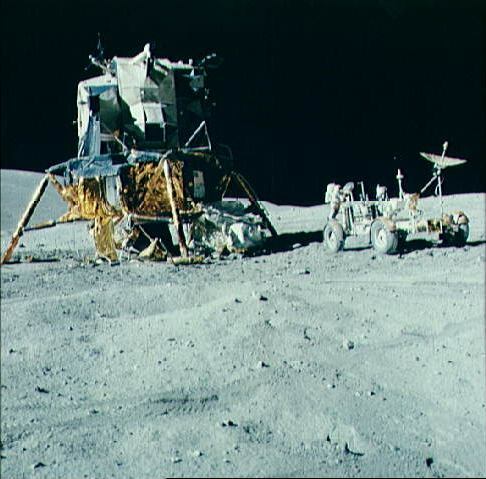 NASA's Apollo 16 Lunar Module "Orion" landed on the Moon during the fifth manned landing mission, carrying Commander John W. Young and LM pilot Charles M. Duke Jr., the ninth and tenth men to walk on the Moon. M. Watt discovered asteroid #2991. NASA's STS 100 (Endeavor) docked at the International Space Station on a mission to deliver the Canadian robotic arm. Powerful solar flares damaged components on Nozomi, the Japanese Mars mission. The ISS Expedition 9 crew arrived at the International Space Station aboard Soyuz TMA-4. International Space Station Expedition 9 commander Gennady Padalka and NASA science officer Michael Fincke lived aboard the station from 21 April 2004 through 23 October 2004. They returned to Earth in their Soyuz TMA-4 spacecraft which landed at 8:36 PM EDT (0036 GMT). Russian Space Forces cosmonaut Yuri Shargin, an ISS visitor, also rode the in the Soyuz return flight. Padalka and Fincke returned home after an eventful 188-day tour in space that began on with their launch on 18 April 2004. They made some unexpected repairs and conducted four spacewalks, including one of the shortest on record and another that marked the first use of Russian spacesuits for a US segment operation.